TENERIFE – “Exceptional!” That’s the word used by maestro Diego Navarro – the superstar of the Fimucité Film Music Festival, who knows a thing or two about great orchestras – to describe the performance of the festival’s Youth Symphony Orchestra at a concert of famous scores from action movies Thursday night. 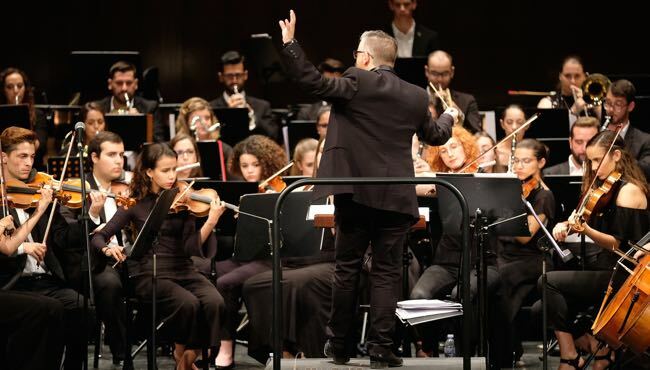 Conductor José A. Cubas led the 85-piece ensemble through a wide-ranging number of cues by mostly Academy Award-winning Hollywood composers in an evening titled “Warriors From the Silver Screen”. The musicians performed with evident enjoyment and there were fine contributions by soloists including vocalist Antonella Vega Gutiérrez, violinist Eugenia Jaubert, flautists Elisa Bartolomé Gómez and Ana Ayala and horn player Susana Rodríguez Fariña. 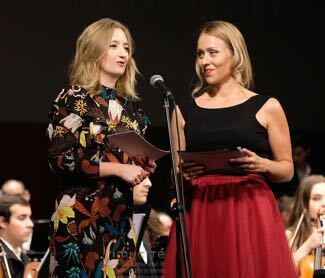 The concert began with music from ‘The Witcher 3’ video game by Polis composer Marcin Przybylowicz, who was on hand along with Agata Grabowiecka (pictured above with host Vanesa Bocanegra) from the Krakow Film Music Festival, which helped produce the concert. Epic themes from “El Cid” (1961) and “Ben-Hur” (1959) by three-time Oscar-winner Miklós Rózsa then topped and tailed the show, which also featured two suites by Oscar-winner Hans Zimmer from “Gladiator” (2000) and “King Arthur” (2004). A plangent suite from “The Last Valley” (1971) by four-time Oscar-winner John Barry began the second half followed by the thunderous “Ride to Diablo” cue from “Taras Bulba” by double-Oscar-winner Franz Wazman. The Celtic-influence “For the Love of a Princess” cue from James Horner’s Academy Award-winning score for “Braveheart” (1995) led to Jerome Moross’s powerful main title theme for “The War Lord” (1959) and the pure adventure of Oscar-winner Elmer Bernstein’s “River Crossing’ cue for “Zulu Dawn” (1979). As if in celebration of that notion, in an encore played with tremendous enthusiasm, the Youth Orchestra reprised Waxman’s call to action from “Taras Bulba” and you could see the horses running free. Fimucité XI at Santa Cruz de Tenerife began on Sept. 22 and runs to Sept. 30. 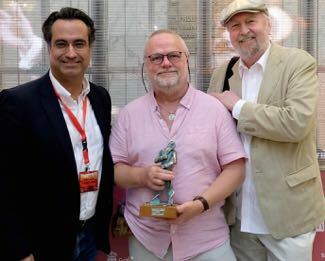 This entry was posted in Music, News and tagged Agata Grabowiecka, Diego Navarro, Fimucité, Fimucité XI, Fimucité Youth Symphony Orchestra, James Fitzpatrick, José A. Cubas, Krakow FMF, Marcin Przybylowicz, Santa Cruz de Tenerife, Tenerife, Vanesa Bocanegra. Bookmark the permalink.